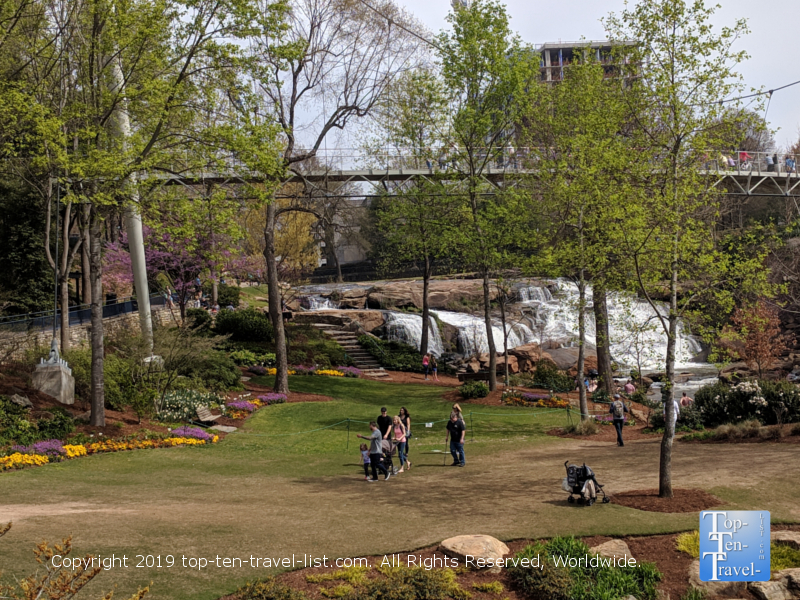 12 Free Things to do in Greenville, South Carolina - Top Ten Travel Blog | Our experiences traveling throughout the US. 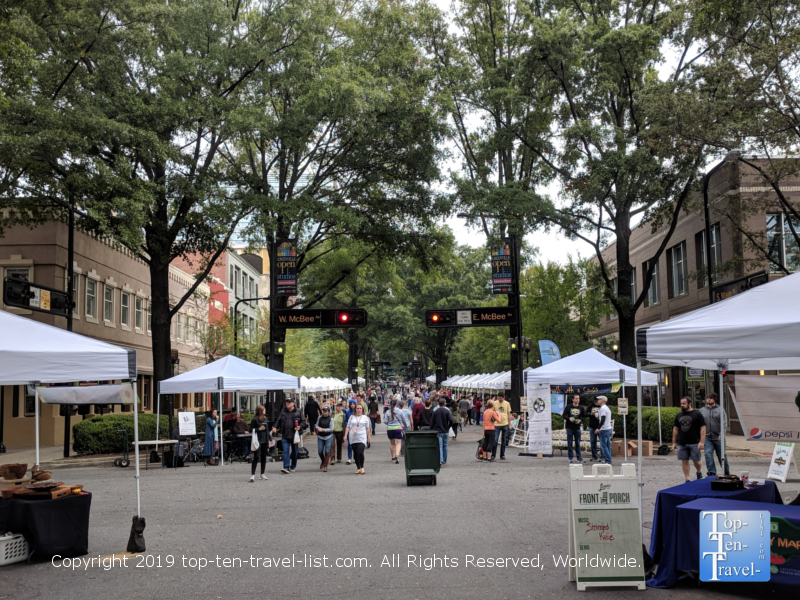 Located in the heart of the region of South Carolina known as “The Upstate,” Greenville has become a trendy place in recent years thanks to its’ emerging foodie scene and revitalized Main Street. Mild weather and close proximity to the Blue Ridge mountains also continues to draw nature lovers to the region. The city is ever growing with many new foodie restaurants, attractions, & hotels sprouting up in seemingly every direction. Unfortunately, with more popularity comes increased pricing, especially in the dining & lodging department. To help keep your trip costs down, I have compiled a list of the best free attractions in the area. Fortunately, many of the best things to do are naturally free, with nature and art based attractions in abundance. 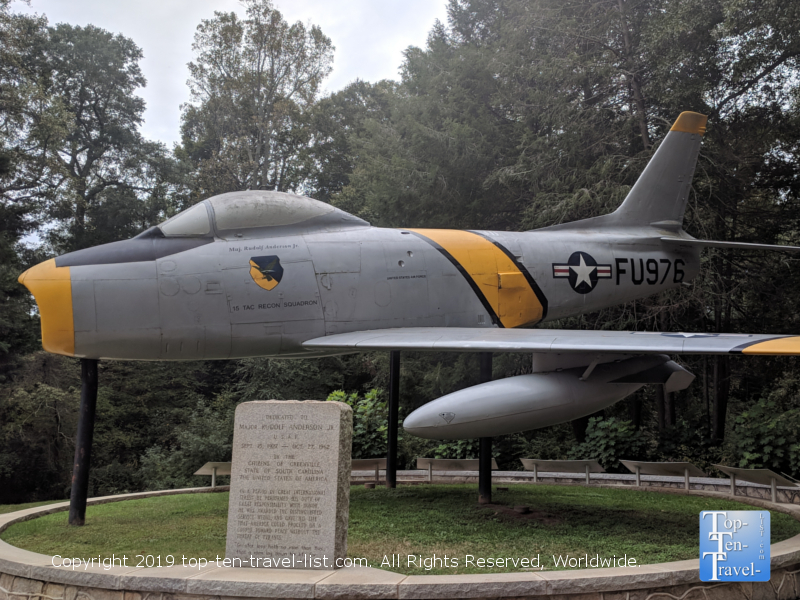 Those looking to keep their trip budget-friendly will be happy to hear that there is plenty of free fun to be found throughout the Upstate. 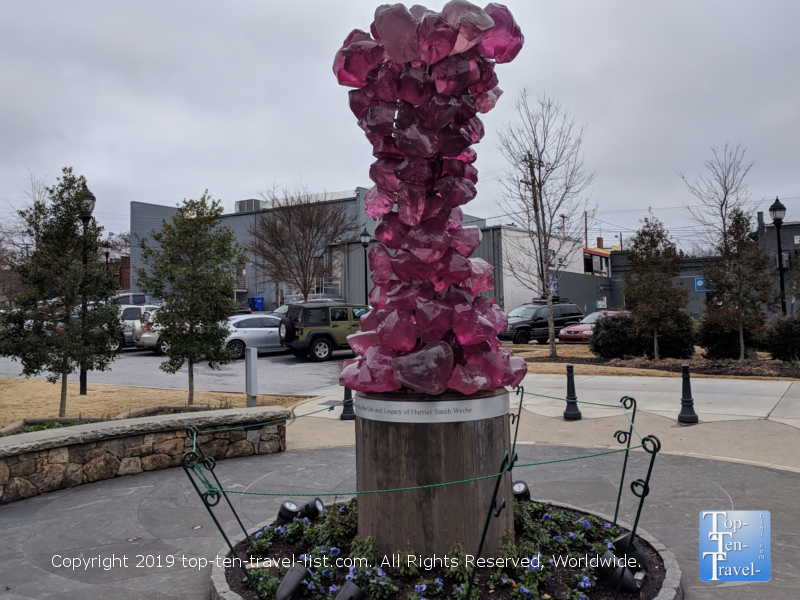 Take a look at my top 10 free attractions in Greenville (note: I have included a few wonderful natural attractions within a 20-30 minute drive). 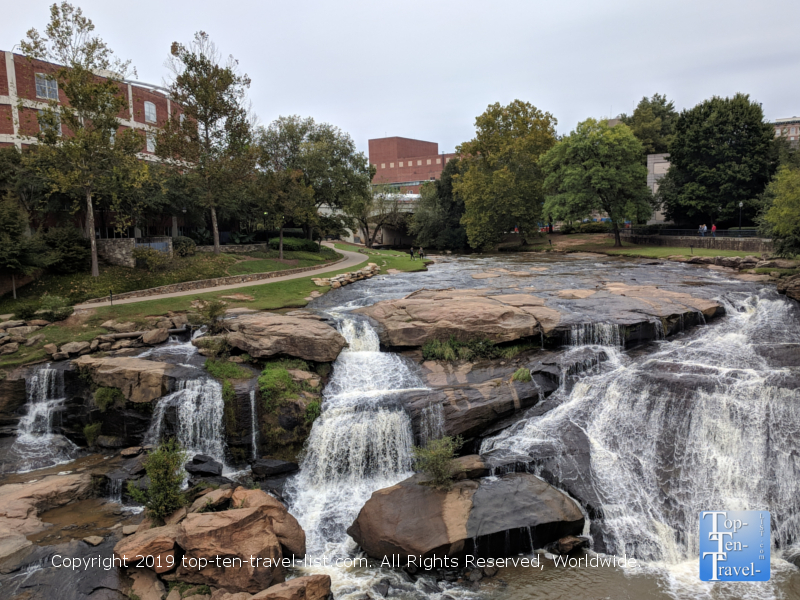 The beautiful centerpiece of downtown Greenville, which draws tourists from all over, is Reedy River Falls, a beautiful 28 foot cascading waterfall located in the historic West end neighborhood. The best view of the waterfall can be enjoyed via a walk across Liberty Bridge, a 355 foot long suspension bridge. The park is considered to be the oasis of the bustling downtown – a place to relax, picnic, enjoy a nature walk, stroll around the gardens, and simply de-stress. Nature lovers will definitely want to plan for a stroll around this quaint park. The park is also home to numerous free events including a popular Moonlight Movies series, taking place Wednesday nights in May and September. There are 2 charming restaurants with great views of the falls: Mary’s and Paserelle Bistro. Paserelle is a quaint French bistro with a nice patio area overlooking the falls. The food is great too and the service amongst the best downtown. Location: 601 S. Main St. Tip: Free parking can be found on Main Street and on nights & weekends in the Richardson St. garage. The GCMA is a small facility focused on spotlighting the works of American artists, including renowned painters Andrew Wyeth and Jasper Johns. For such a small town, the museum is quite impressive, featuring the largest public collection of watercolors by Wyeth. 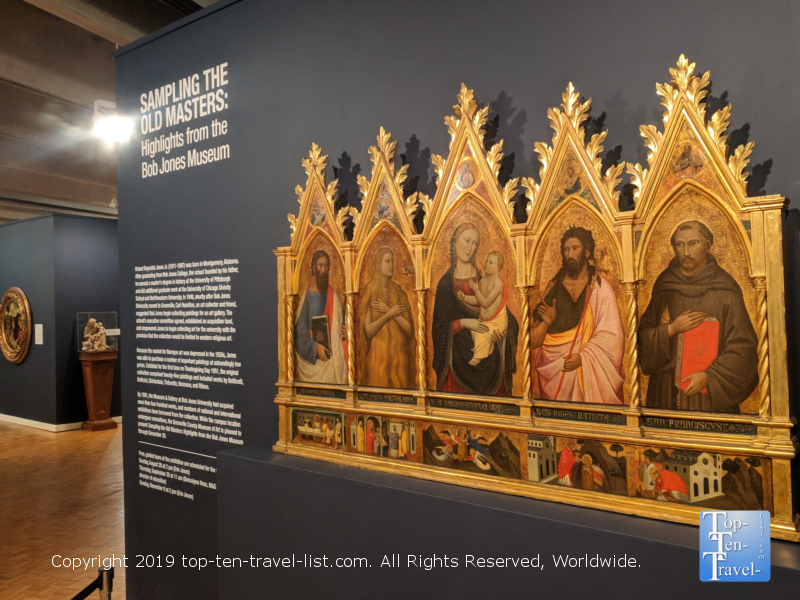 If you are an art lover, or just seeking a relaxing thing to do in the city, consider a stroll around the Museum of Art. Special exhibits mean there is something new to see on every visit. Currently, the museum is spotlighting works from the Bob Jones Museum. Location: 420 S. College St. Tip: Sundays at 2, the museum offers a free family art event. If you are the fitness type, you will definitely want to check out the Swamp Rabbit trail while in town. As a favorite of both locals and tourists, this 22 mile paved bike route is there for anyone who wants to get in a workout or simply enjoy a nice walk away from the city congestion. The multi-use path is enjoyed by walkers, joggers, skaters, and cyclists. 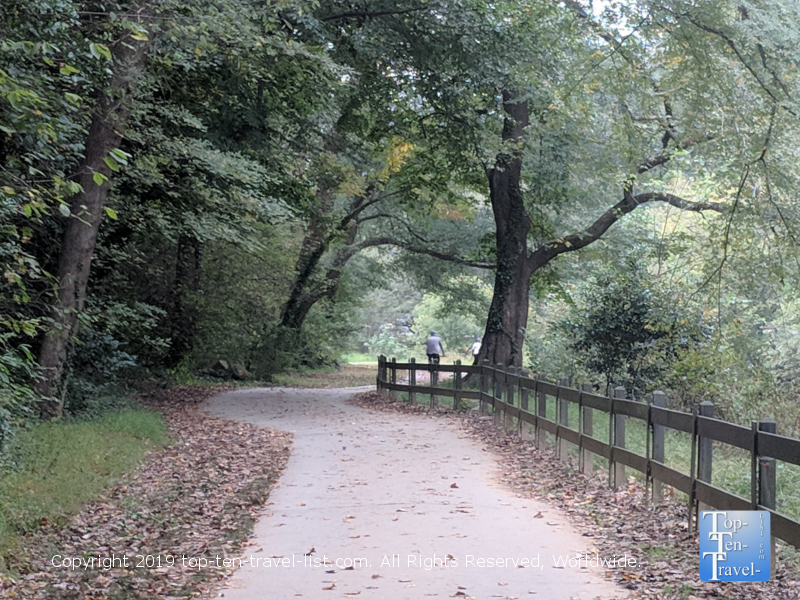 Although the path is quite bumpy in spots and sections are often closed for repairs, it’s the best recreational path in the Upstate area, and therefore worthy of a visit if you are looking to take your workout outdoors. The most scenic sections of the trail are those which traverse through Furman University and Lake Conestee Nature Park. A large section of the path conveniently runs downtown through Cleveland Park. Cleveland Park offers a number of amenities including tennis courts, fitness stations, and volleyball courts. 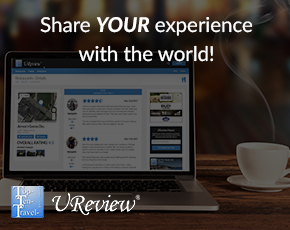 If you want to keep all your activities near the downtown region, this is the best place to start your ride! Take a look at this handy SRT map to plan your route. If you need a bike rental, Reedy River Rides offers half day rentals for 20 bucks. 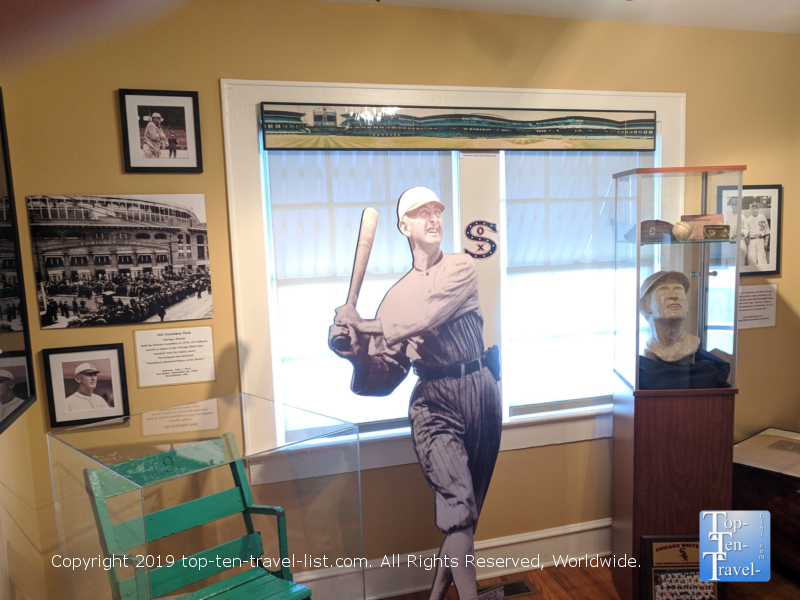 American baseball player Joseph Jackson, better known as “Shoeless Joe Jackson,” lived in Greenville for many years and even returned homesick after being banned from baseball. His childhood home was moved from its’ original location and turned into a museum across from Flour Field, home to the Greenville Drive, an affiliate of the Boston Red Sox. Anyone who follows baseball or has seen the fantastic Field of Dreams movie knows that Shoeless Joe Jackson story. He was banned from baseball during the 1919 Chicago Black Sox scandal. If you are unfamiliar with baseball, the scandal involved the team fixing the game. An interesting side note on the history of the “Shoeless Joe Jackson” nickname. During a game, Joe threw his cleats off as blisters from his new shoes were hurting his feet. Free tours are available, or you can simply browse around the house Joe actually lived in and view the various memorabilia now adorning the walls. For anyone who loves baseball or the classic Field of Dreams, this is a must- see while in town. Tip: If your visit falls during the spring/summer months, consider attending a Greenville Drive game at Flour Field just across the street. Games begin in April and tickets start at just 5 bucks. Lake Conestee is one of the few places to hike within the city of Greenville. Most of the big state parks and waterfalls are located at least a half hour outside of the city. If you would like to soak in a bit of nature in a quiet setting without a long drive, Lake Conestee is the closest place to do so. This 400 acre park is located just 6 miles outside of downtown Greenville, and thus, is easy to access anytime of day. There are 6 miles of trails here to enjoy (although they need some better markage for sure), featuring views of diverse habitat including wetlands and hardwood & evergreen forests. You may see various small mammals along the way including deer, beaver, fox, river otter. As mentioned above, a small section of the Swamp Rabbit trail runs through the park if you prefer to cycle. Overall, it’s a great place to take a break for an hour or so, enjoying peaceful views of natural surroundings while also getting in a refreshing workout. Location: 601 Fork Shoals Rd. Tip: There are no trail maps available at the entrance. I recommend printing one off the website. Lake Conestee trail map. 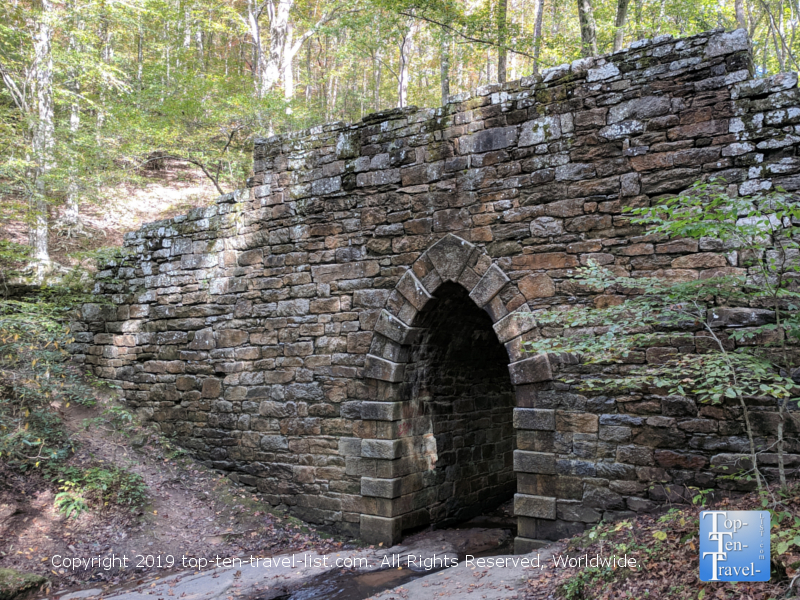 Poinsett Bridge is a beautiful historic stone bridge with a 14 foot Gothic arch. The bridge was built in 1820 as part of a road which ran between Greenville and Asheville, NC. The bridge is very otherworldly and almost appears to be a portal to another world. Not surprisingly, many paranormal sounds have been heard here, with various ghost hunting groups reporting strange occurrences via their EVP monitors. 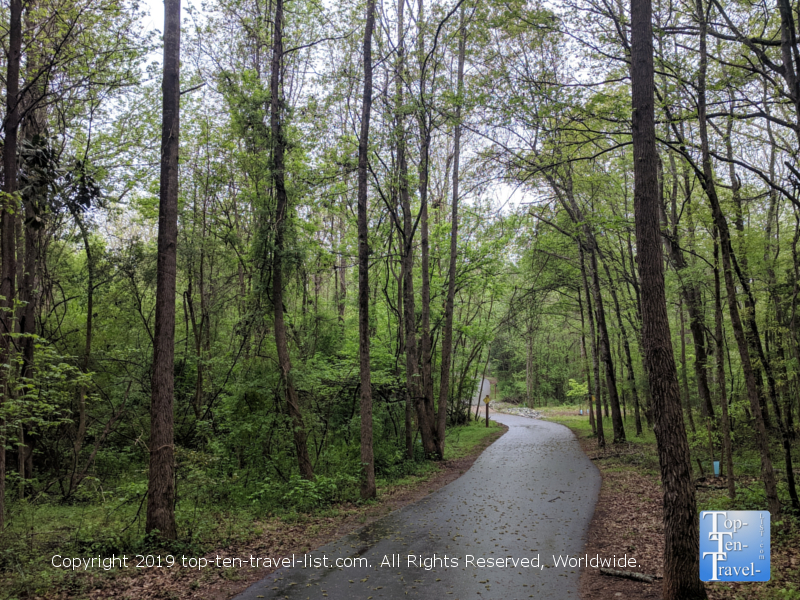 The drive over from Greenville is quite beautiful, passing through the quaint countryside with numerous opportunities for detours along the way. You will notice many stands selling the SC specialty – hot boiled peanuts – be sure to try some! 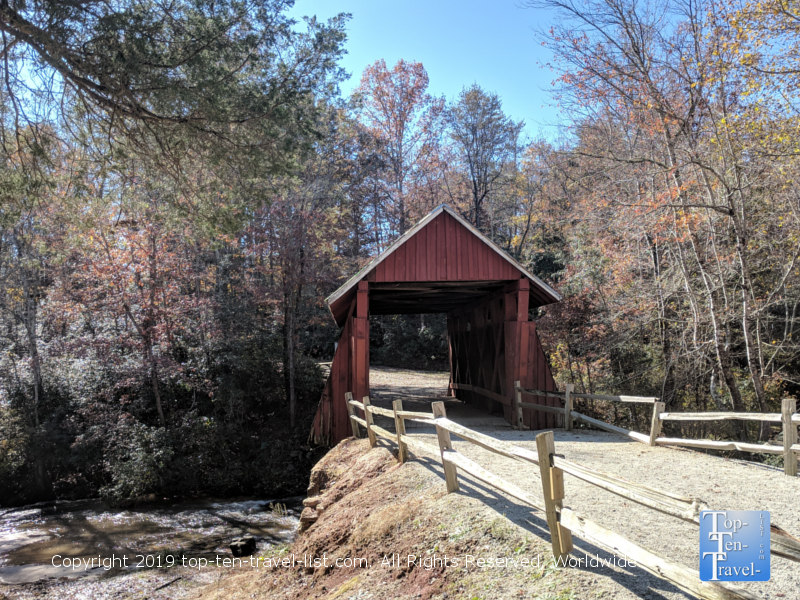 Campbell’s Covered Bridge lies about 11 miles north of Greenville and is a great side trip for photographers and history buffs. The bridge, built in 1909, is the last standing in South Carolina, yet is still in pretty good condition. The bridge is particularly beautiful during the fall season as the colorful hues of autumn comprise the background. Picnicking and photography are popular past times here during the milder seasons. To make this drive a bit more worthwhile, you may want to consider driving an extra 20 minutes up to Chestnut Ridge Heritage Preserve, a beautiful area featuring numerous hiking trails and small waterfalls. Tip: Combine a trip to Poinsett Bridge & Campbells to save yourself some time. 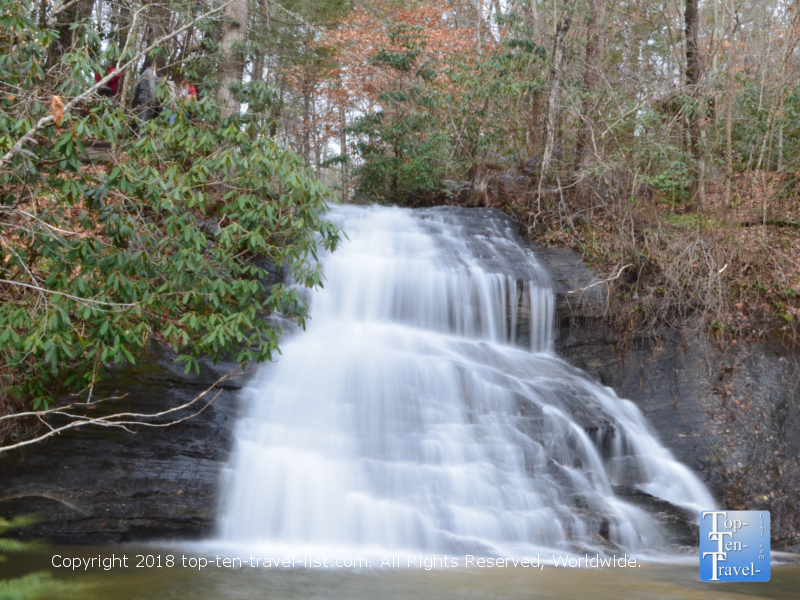 Beautiful Wildcat Branch Falls, a small but beautiful 2 tier waterfall located just 10 miles outside of Greenville, is a definite must-see while in town. Unlike most states parks in the area, it is completely free to see this roadside wonder. What’s even more, if you continue on to the adjacent 1 mile out-and-back trail, you will come across a 100 ft waterfall, as well as enjoy lovely views of the forest and creeks. Any nature lover, photographer, and fitness buff visiting Greenville should really take the time out to see this gorgeous waterfall. Not only is this one of the closest waterfalls to the city, it’s also one of the most stunning. As this waterfall is located right off the Cherokee Scenic Foothill Drive (SC 11), the views on the drive over are also quite beautiful. This is a great half day trip outing for anyone looking to totally relax in nature. Tip: Wear comfortable workout clothes, hiking shoes (the trail gets very muddy), and bring with a water bottle. If you take a stroll around downtown Greenville, you will notice many unique pieces of art. There are dozens of beautiful works of art within an easy walk of Main Street. You can download this Greenville Public Art Tour map to help guide you along the way. If you are looking for a family friendly activity, Mice on Main, inspired by the children’s classic Goodnight Moon, is a big hit with families. Hidden along 5 blocks of Main Street are 9 mini bronze mice sculptures. This is a fun free scavenger hunt activity which is fun during the warmer months. This handy little Mice on Main Clues guide will help you along the way. Furman University frequently ranks as being home to one of the most gorgeous college campuses in the country. 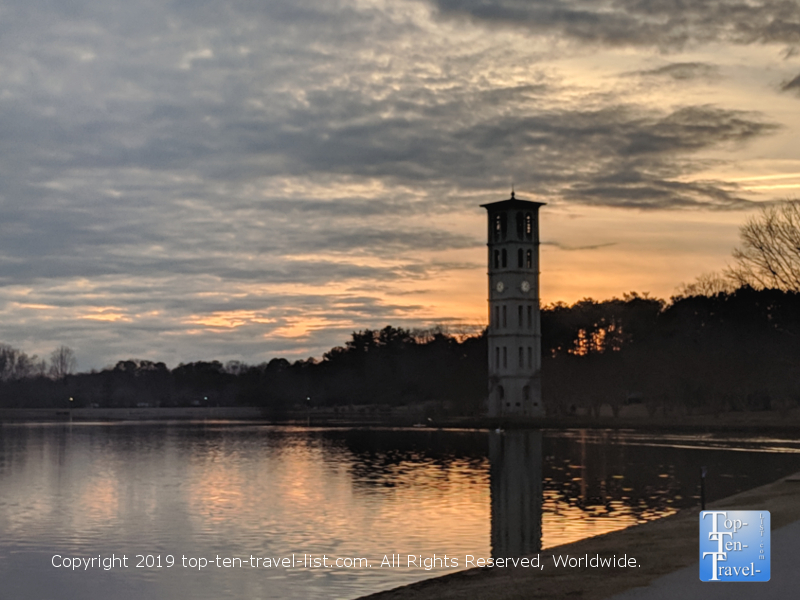 There are numerous trails on the grounds including a portion of the Swamp Rabbit trail as well as a 1.5 mile loop around beautiful Furman Lake. Although it may seem a bit odd to walk around a college campus, this is one of the prettiest places in the city to take a nature walk or get in a scenic cycling workout. The sunsets here are quite beautiful, so try to plan your walk at this time, if possible. Parking is free for visitors Fridays after 5 and on weekends in a large lot right next to the lake. Rudolf Anderson Jr. War Memorial pictured above. Next to the park is the Greenville Zoo, a very small zoo which only takes an hour at most to walk through. The zoo hosts a number of events throughout the year and is currently planning for expansion. Extra bonus – if you have an electric care, you can charge it for free while you explore the park! The city of Greenville puts on over 300 events per year. From the Saturday Farmer’s Market, to themed 5k races, to the Festival of Trees Christmas favorite, it is not hard to find some event to your liking. Many of these events are free including the Downtown Alive and Main Street Concert Series. Every Friday from March 22-September 27, you can enjoy a free concert at NOMA square. Other fun free events include Moonlight Movies in the Park, which includes screening of popular movies on a big flow up screen in Falls Park (Wed nights in May & Sept.), The St. Patrick’s Day Parade & Irish Festival, and the First Fridays art walk. Check the Visit Greenville events page to keep updated on future events. Despite claims of “mild” weather, winter days typically see highs in the 30-50’s and summer days can easily soar into the 90’s for weeks on end. 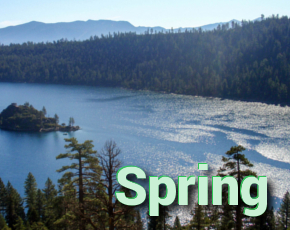 Spring is the best time comfort wise to enjoy the outdoors! Greenville is an extremely busy popular city. The traffic is bad city-wise, and this coming from someone who has lived in several major cities. The traffic downtown is always bad, particularly on weekends. If you are not a fan of crowds, plan your downtown visit on a weekday, preferably in the morning or afternoon. If you are coming here via a roadtrip, bring your own bike as rentals are quite overpriced. Free 2 hour side street parking is available, although tough to find in the afternoon and on weekends. On weekends, the Richardson Street (66 Richardson St) parking garage is free. A few affordable (and decent) breakfast choices include: Sully’s Steamers (excellent steamed bagels for just 5-7 bucks), Tupelo Honey (a Southern style breakfast chain with a great pick 3 for $10 menu) and Biscuit Head (a trendy Asheville chain with humongous biscuits). These restaurants are also the few that offer vegetarian choices. Port City Java is a nice affordable choice for coffee (2 coffee for 4 bucks and 1 refill) – the coffee is always great and the outdoor seating is also the nicest.